Over the years, I have tried many (and I mean MANY) eye liners in the hopes that one of them would stay in place all day. A few years ago, I met and fell in love with Bobbi Brown’s award-winning Long-Wear Gel Eyeliner (in black). This is the best eye liner I have ever come across for lining the top lash lid (right by your lashes) to give you that eyes-wide-open lash-enhanced look. (I personally don’t use this product on the lower lash lid. It can look quite harsh there as it dries quickly so is not really suitable for a smudged effect.) It’s the perfect product for those days when you don’t feel like drowning your face in war paint, but need just a single stroke of understated definition, quickly applied in the morning. This easy-to-apply quick-drying liner lasts all (freaking) day and does not start smudging around 4pm. 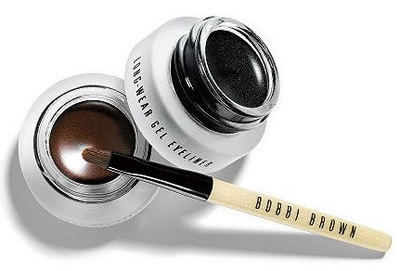 Application Dip the tip of Bobbi Brown’s Ultra Fine Eyeliner Brush (coat both sides of brush head) into the pot. Wipe off any excess before applying to eyes. Work quickly as the product becomes transfer-resistant once dry. Awards Best of Beauty by Allure Magazine (2012). Winner of 50 Best Beauty Products 2013 by Siempre Mujer. Selected as a Best Beauty Buy by In Style (May 2013).